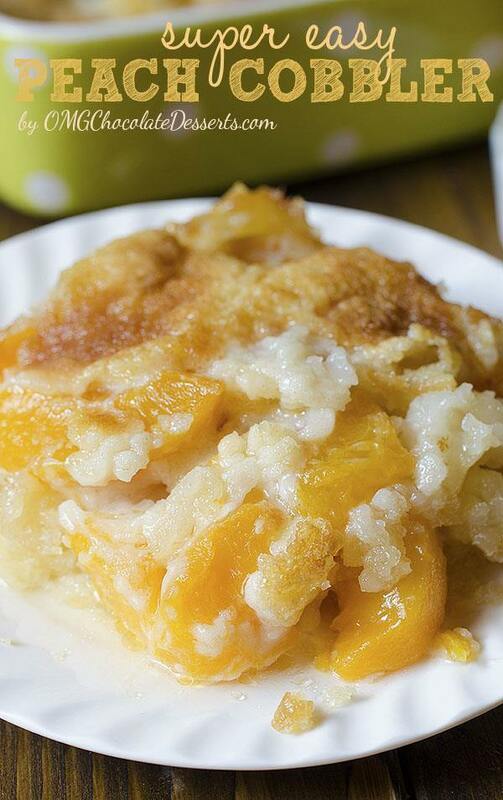 Maybe I said something like this in my previous posts, but after the first bite of this fantastic Peach Cobbler, my husband and I had a unanimous conclusion, it is one of the most delicious desserts I ever made! You don’t believe me? It doesn’t cost a thing to try it yourself and here are a few more things which will surely not leave you untouched. Except being so tasty, this Peach Cobbler is so simple to make that it will be an easy job even for a person that never visited the kitchen. Count it yourself! How much time do you need to mix a cup of flour, a cup of milk, a cup of sugar and a teaspoon of baking powder, and then pour that mix over melted butter and over all that, add the peaches from the can? All in all two or three minutes and you are ready for baking it in the oven. What is also a big plus for this recipe is the price of this fruit. If you take into consideration that the most expensive thing is butter and that ,except maybe the peaches, you already have everything in your pantry, it’s clear that Peach Cobbler is a super economic recipe. And now, count everything up and you get a simple solution – super delicious, super easy and economic! If you have doubted until now, I’m sure that this beautiful Peach Cobbler will surely be one of your favorite recipes for this summer! Anyway, enough talk! Let the baking begin!!! 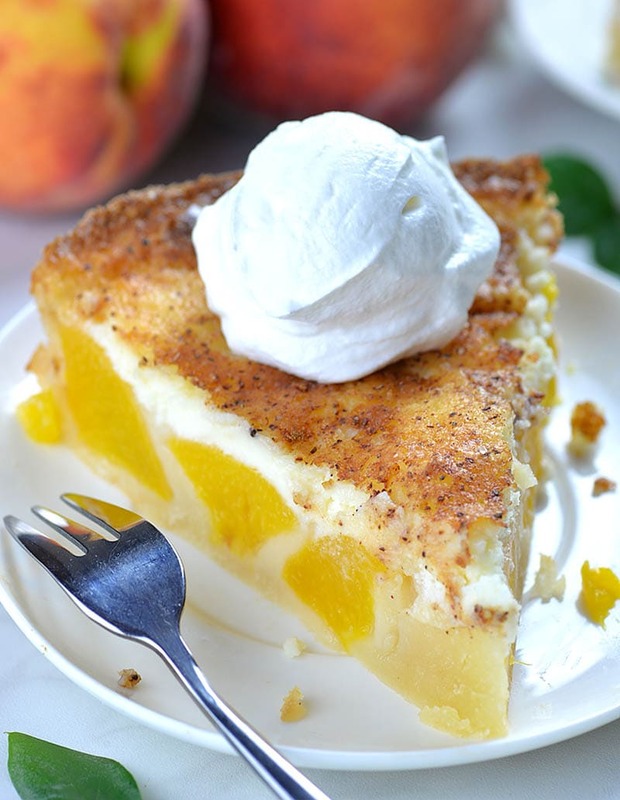 Just Simple Peach Cake – What you will get on your plate is a pile of peaches and dough, but when you try the first little spoon of this pile, the first thing you will see next is a guaranteed empty plate. 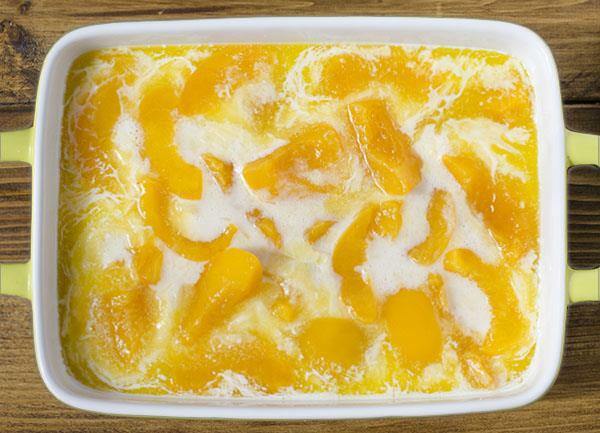 Delicious Peach Cobbler can become one of your favorite recipes – it’s super tasty, super simple and super economic. Place the peaches on top of the batter and bake about 30 minutes, until golden brown. All I can say is Wow! Looks delish. Gonna make this tonight. It takes close to an hour to cook. My mother used to make this almost every Sunday for dessert after our Sunday lunch of roast which she left cooking in the oven during church services. She and I use canned peaches with all the juice dumped into the mix. 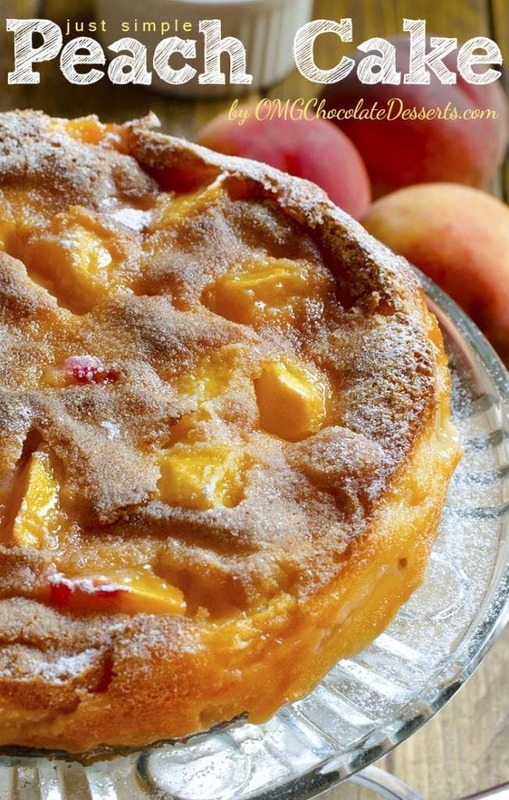 The cake or biscuit batter rises above the peaches when it cooks. I also use sweetened condensed milk. A dash of salt will tame the sweetness for sure and make it better. On the cobbler , very good, but my cooking time was closer to 60minutes. Hi Amanda, I heven’t tried it with coconut flour so I can’t help you, sorry. Here’s what I found searching it online: In baked goods, you generally want to substitute 1/4 cup to 1/3 cup coconut flour for 1 cup grain-based flour. You will also need to increase the number of eggs. There are no eggs in the recipe. Does it change when using coconut flour? Sorry Renee, can’t help you with that. 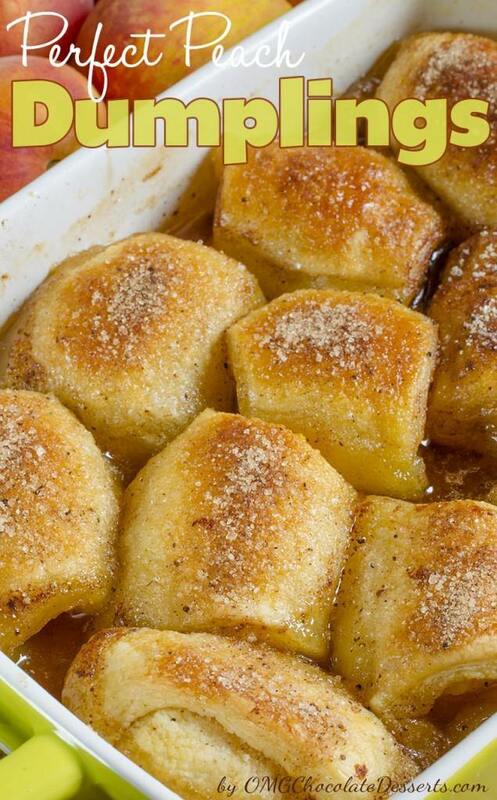 This has been my cobbler recipe for over 40 years, my husband’s grandmother made it and everyone in the family uses no other recipe for cobbler. I use fresh fruit and if you use selfrising flour you can leave out the baking powder. Great cobbler!! I used this recipe for years and lost the recipe. I believe this is the one. I tried the Allrecipes one and it did not call for baking powder and it eas a total fail!!! So excited to make this tonight!!!! Do you dump the whole can of peaches including juice from can or do you drain? Hi Jenn, you don’t need juice, drain the peaches first. My mom does too. She’s 89 ! Can you double this and turn out well? Thinking about this for family reunion. Hi Stephanie, you can double this and use 9×13 inch baking dish. Hi Heidi, use unsalted butter. Salt should always be used in sweet recipes. It balances out the flavor of the sweetness. I always use salted butter . I use self rising flour. I don’t use any baking powder. I don’t drain the peaches. I double the recipe. I bake for one hour at 400°. We have a big family and this turned out delicious every time. It’s one of her favorites! My mother-in-law passed the recipe down to me. It’s been used in our family for 50+ years. How many servings does this recipe make approximately? Can you do this with other fruits? I’m thinking apple or cherry cobbler with a can of fruit pie filling. Do you think it will work? Mine didn’t turn out after 30mins. It was still very runny, and I did drain the peaches, but they were fresh frozen from my peach tree not canned. I let them thaw. I’m sorry Rosemary, maybe you should bake it a litlle longer because every oven is different and baking time also depend on baking dish you use, or it might be the problem because frozen peaches. I like to use some of the juice, say at least half of it, and mix in a couple tablespoons of tapioca for thickening, as in pies, the amounts can be found on the box. It makes for more yummy fruity-ness, and this also works with other fruits like cherries etc. Just tweak it to your own tastes. Yes I believe it needs to bake longer as well. Nancy, good idea to use juice and add tapioca. I don’t like to waste anything. I will try with fresh peaches and a bit of tapioca..maybe even nuke the fresh peaches a bit, for a head start. I have used this recipe for years! It’s the only one I use! I actually drizzle a couple tablespoons of juice from the can of peaches over the top and sprinkle a little cinnamon on it before baking. Mine usually bakes closer to 40-45 min. Like you said, every oven is different. Served warm with vanilla ice cream! Then cold the next morning for breakfast!!!!! Making tonight, but using some fresh mango’s just picked from the tree! Billie, do you really have a mango tree?? If so, did you plant. Are yall the only one that takes care of it. Made this for my boyfriend last night and since we can’t resist chocolate we added dark chocolate chips on top of the cake mix– highly recommend! Thanks for the recipe!! If using fresh peaches do I need to cook them first? I used fresh peaches and didn’t cook them first and it came out great. I did on the other hand cook it longer. Do you add more sugar if you use fresh peaches? I don’t know what I did wrong but I didn’t care for this cobbler. I like the old fashioned cobbler like my mother always made. Maybe the ones that were runny didn’t use real butter. Some margarine s have too much oil and water in them. Going to try this recipe tomorrow for Sunday dessert. I have been doing this recipe for years. It IS amazing. the recipe given to me used the heavy syrup 28 oz can of peaches and after placing the peaches on the batter, I pour the liquid over all and bake. Yea Amazing!!! Super yummy with fresh cherries, touch of cinnamon and nutmeg. Did have to bake an extra 15 minutes. This is the recipe I’ve been using since I was in high school and I’m old! lol To make it even easier I also have used the yellow butter cake box mix. And when using peaches be sure to use a tiny bit of almond extract. You don’t want anyone to figure out what the flavor is but it really enhances the peach taste. This IS a good recipe and has been for over 30 years! We used to call it fruit cocktail cake or Cuppa Cuppa Cake. You can use any canned fruit you like. You need 1/2 tsp. salt or it is pretty bland. By the way, the word you have spelled requiered is spelled required and this recipe is definitely ECONOMICAL to make; not economic. As long as we got the point, it shouldn’t matter how the word is spelled, just sayin. YOU ARE AWESOME! found this on Pintrest and my boyfriend was 1) surprised I actually baked something and 2) LOVES it! Also, I did have to bake longer. We made this with 2 cups of fresh peeled sliced peaches. It was too much for my 8×8 pan (good thing I thought to put a cookie sheet under it!) so it overflowed a tad and it did take 50 min to bake until golden brown but IT WAS DELICIOUS!!! I am going to up the fresh peaches to 4 cups and keep everything else the same but put it in a 9×13 pan. Should help the baking time and make it more fruit and less cake. I can’t wait to make it again. Thank you for the recipe! It was really quick and easy to throw together and it reheated nicely the next day. Did you have to use extra sugar with the fresh peaches? I made this yummy cobbler a few weeks ago, it was so good I had to come back and mention it! Thank you! I made this last night. It did not turn out. The “crust” was like rubber. yum! My husband puts a request in for me to make this every month. Fresh peaches are better but either works. The old recipe doesn’t use baking powder. And only use a small amount of the cup of sugar in the batter. Sprinkle the rest on top before putting in oven. Carmalizes and makes an even better crust. Homemade ice cream or ice cream tops it perfectly. Love this recipe!! But as Donna said I also sprinkle sugar on top. And I never made it with baking powder. My friend gave me this revised recipe 20 some odd ago. I loved the way the crust was over the fruit!! I have made 3 blackberries cobblers recently. One I made with Splenda, it wasn’t the same so back to real sugar we went!! I have used Splenda many times before and didn’t have any problems at all. Don’t know why it didn’t taste very good. Could I make this with fresh berries? Hi Taimane, you could do that. You could add 2-3 tablespoon sugar, and bake a little longer. Iv used this recipe for years my family loves it. Every time we have a family gathering I am asked to bake peach cobbler. I use half of the juice to make it a little moist . Comes out fantastic every time. Iv even used blueberries its good also. Love this recipe! i think i will try for new years, one question, what could i do if i wanted a thicker crust? Hi Rosa, if you use fresh peaches you should cook them first. Can this be made in a crock pot instead? I haven’t bought a new baking dish since my old one broke, so I have been trying to find recipes that can be made in a crock pot instead. HIi Kristen, I can’t help you with that. I was able to make this recipe in the crock pot and it turned out pretty good! It took 3 hours on low heat, but it was a hit with the in laws! Mine came out soggy. Not sure why, made it for my family. No pleased! Too much sugar for my family I used 1/2 cup of sugar still too sweet will use less next time but it was well loved. I am making this tonight! But I am wondering why you are not suppose to stir the ingredients together? I am wondering the same thing. I made it and folded the flour in a little bit. It didn’t turn out so great that way, had pockets of flour on top uncooked after it was done. It was still good, just a little messed up. My question is dump it in untouched into the butter? You do mix the batter (flour sugar etc) when you pour the batter over the melted butter you DON’T STIR that part. My husband has a milk allergy. Do you think this would work with margarine and almond milk instead? Hi Kelly, I’m sorry I haven’t tried and can’t say would it work. I made mine with coconut almond milk and it turned out amazing! You can use lactose free milk and it will turn out ok. My fiánce is lactose intolerant as well. This really is delicious! I used self rising flour and made it even easier! Just 1 of everything…..stick of butter, cup of flour (sr), cup of sugar,cup of milk, then fruit of your choice! That’s it! Do you drain the peaches before adding them? Hi Heather, yes, drain the peaches first. Love this recipe. Over the last 30 years, I have used this recipe a lot to make various fruit cobblers. To give the crust more flavor, add 1/4 to 1/2 teaspoon cinnamon to dry ingredients before adding milk. Hello! Tried this recipe and it was delicious!! thank you! Hi Tracey, it’s not 9 x 13 pan. The dish you see in the picture isn’t standard pan it’s 7 x 9 inch dish, so the volume is the same as 8 x 8 inch dish. I made the recipe exactly to the directions and it looks super runny. It has now been in the oven for 1 hour leaving it in for 15 more…hoping it turns out? Do you let it set after it comes out of the oven? Never mind after waiting 1hour 30 mines they are now burnt on the edges and very very raw in the middle…a waste. I just pitched them. To much butter. 1/4 c would have been plenty. I have this recipe from an old church cook book. It’s my “go to” recipe when I want a quick and easy dessert……and it’s so good. I usually add frozen blueberries on top, but when I do add peaches, I add some cinnamon to the batter when mixing. I do drain the juice off. I’m sorry Connie, I can’t help you with that. My grandson is diabetic as well. I always use (Splenda for baking) no one notices that the difference. Good luck! Mine turns out every time. Hi Patricia, thanks for this info. What is the equivalent of fresh peaches to 15 ounces of canned peaches? Some of that 15 ounces is juice. Hi,, are you using plain flour or self rising? Hi Jan, you don’t have to cover it. Are you sure the amount of butter is correct? Thank you for this recipe! I made it for the 4th of July and it was quickly gobbled up. I believe this recipe would be better with an egg in the batter. The cake part was like runny dough. I did cook it for almost an hour and had to drain the excess butter off the top. Wish I had read the comments first. I use this recipe with fresh peaches: 1 qt. of sliced peaches. I use I cup of self-rising flour instead of the flour and baking powder. Mix the sugar and flour together. Mix the milk and melted butter together. Add wet to dry ingredients. 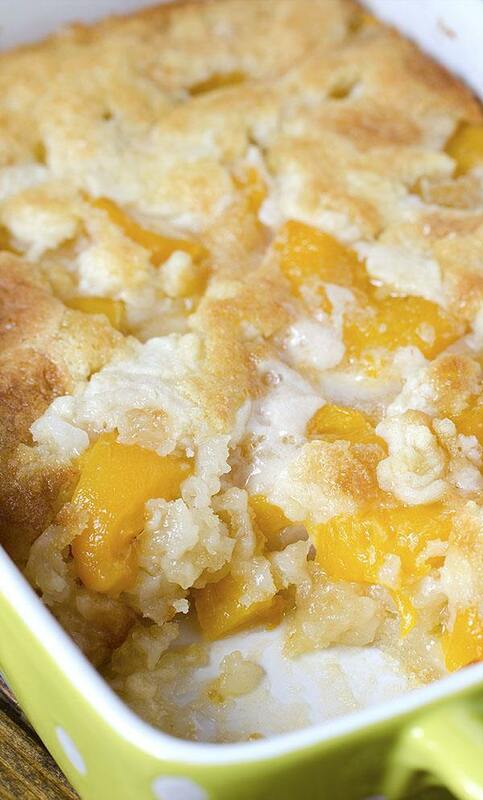 Pour into casserole and top with peaches. Bake @ 350 for 40 minutes. Thanks Shanna, I’m happy to hear that! I followed this recipe to a T and it did nit turn out. It was bubbly and gooey, and I baked it for over 60 minutes. I was so disappointed as this was the second cobbler recipe I’ve tried. I used this recipe and it was a winner! I tried canned pears instead of peaches and added additional sugar in the pears just to make them a little sweeter. I always sprinkle cinnamon and sugar on the top before I place in oven. It was a major hit! If I am baking in a 9×13 foil pan do I double all of the ingredients ? Hi Charmayne, yes, and also you’ll need to bake it longer. I made this today, and I am taking bites in between typing this comment. This is by far the easiest and tastiest cobbler ever! I believe it was Miss Vera who suggested adoing a bit of almond extract. Im glad I did. Delicious. Does almond mild work as a milk replacer? Hi Tammy, sorry I haven’t tried it with peach pie filing. I’m in the process of baking this now for a breakfast treat. I used half milk and half peach juice from the can. Also, I sprinkled cinnamon and nutmeg on 5he too before making. . Another little addition was using brown sugar instead of white sugar.